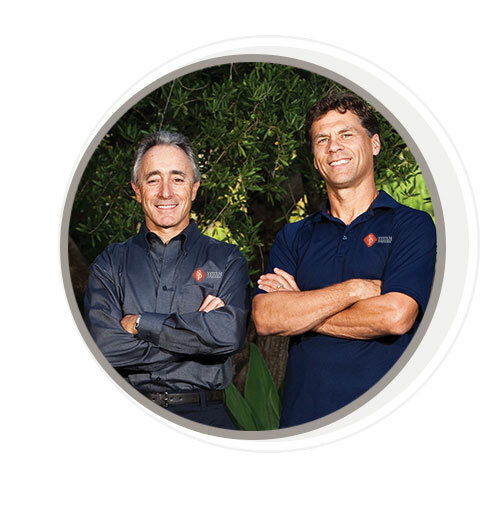 Since 1992, System Pavers Co-owners, Larry Green, CEO, and Doug Lueck, President, have been redefining the outdoor living space industry. After years of success in the South African paver market, Larry Green moved to Southern California to bring this European art and style to homeowners throughout the U.S. Doug Lueck, an experienced and successful businessman in the industry immediately realized a common vision as to how home improvement should be professionally managed with customer service being the highest priority. Having served more than 60,000 homeowners while maintaining a customer satisfaction rate of nearly 95%, System Pavers has grown to become America’s leading designer and installer of outdoor living systems. After years of success in the South African paver market, Larry Green moved to Southern California to bring this European art and style to homeowners throughout the U.S.
Doug Lueck, an experienced and successful businessman in the industry immediately realsized a common vision as to how home improvement should be professionally managed with customer services being the highest properity. Their philosophy: Your home should be an escape from the hectic, cluttered everyday world. It should be a place of beauty, order, and for some people calm that soothes the soul and invigorates the senses. To this end, System Pavers doesn’t just install paving stones, turf, or lights; we design and create havens of renewal and personal joy. Our outdoor living systems create enduring beauty, enjoyment and value, not just impacting quality of life, but a property’s overall value. From the installation team to the owners of the company, our guarantee is to provide the best possible quality, process and products available anywhere- Period! It is this commitment at all levels of our company that have made us the largest residential paver provider worldwide.